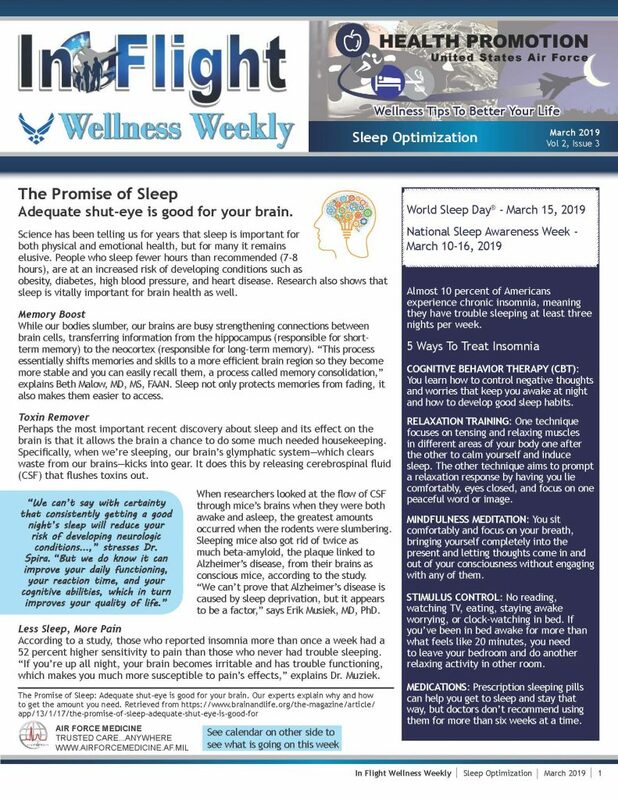 Click here to see the Wellness Weekly: Sleep Optimization, March 25, 2019. For questions or enrollment, please call Dana at 719-556-9642. Health Promotion (HP) is located on the upper level of the Fitness and Sports Center. The stairway in the main hallway or the elevator in the aerobics room are available for customers. Hours of Operation are 7:30 a.m. – 4:30 p.m. Monday-Friday. HP provides a variety of programs and instructional classes. No fees or charges are required for services. Services are available for all active duty, retirees, family members, and DoD civilians. Guests may attend classes on a space available basis. Click here for the flier. HP staff members are available for briefings at commander’s calls and for setting up informational booths at events to advertise programs and promote wellness issues. Starting a new nutrition and/or exercise program? Just want to know where you are? The Bod Pod is the gold standard for measuring body fat and used in numerous peer-reviewed scientific studies. The assessment will also estimate your resting metabolic rate. To ensure accuracy, strict protocol must be followed. Click here for required protocol. Must be a DoD ID cardholder. New to altitude and finding it hard to exercise? Want to train smarter vs. harder? We can directly measure your fitness level through our V02 max treadmill fitness assessment. Once cleared by your doctor, from this 15 minute test, we can determine what intensity levels are aerobic v. anaerobic for you. Additionally, we will identify your true maximum heartrate. Our exercise professionals can then take this information and develop your individualized workout plan. This enables you to know which specific heart rate “zones” you should maintain during exercise in order to attain your fitness goals much faster and safer. Please call 719-524-CARE and ask for the Peterson Health & Wellness Center and for VO2 max. Need new running shoes? Want to see if you can improve your running? We can help improve your running form and offer suggestions for the best running shoe for you based on your strike pattern through motion video analysis. In addition, we will provide corrective exercises if there are any identified biomechanical dysfunctions. Please call 719-524-CARE and ask for the Peterson Health & Wellness Center and for gait analysis. Are you ready to quit tobacco? Our tobacco cessation program is managed by the pharmacy care clinic. Pharmaceutical and behavioral intervention is available to help overcome the challenges of quitting. E-mail hawc.peterson@us.af.mil or call 719-556-4292 for a referral to the program. In addition, Health Promotion offers nicotine-free replacement for smokeless tobacco users. Would you like to lose some weight? Do you struggle to meet your AFPFT AC measurement standards? Would you like to learn about healthy eating? Gain valuable knowledge about your individual caloric needs, healthy choices, meal planning, and exercise to obtain and maintain your healthy weight goals. Attend the group class and schedule regular follow-ups to help with progress. Please call 719-524-CARE and ask for the Peterson Health & Wellness Center Waist Management class. This class is for Diabetics, Pre-Diabetics (PCOS, Metabolic Syndrome, and/or Insulin Resistance Syndrome), & Gestational Diabetics. The class includes review of the Diabetes disease process, monitoring guidelines, eye & foot care, nutrition and exercise. It offers you, as the patient, an opportunity to meet your Healthcare Manager, and learn how the Peterson Family Health Clinic will be assisting you in managing your condition through tracking your labs, providing reminders about labs/exams, and scheduling appointments. This approach to Healthcare Management at the 21st MDG is a team concept, and we need you on our team! Please call 719-524-CARE and ask for the Peterson Health Management Diabetes class. Medical nutrition therapy is available for individuals for a variety of disease states, weight loss, pre/post-natal, pediatric, sports nutrition, etc. Call 719-524-CARE and ask for Peterson Nutritional Medicine to schedule an appointment. This is a 12-week progressive weight loss class series that will educate you on a variety of fitness, nutrition and lifestyle modifications. Registration is required. Call 719-556-9642 to register. Would you like your children to be more active, eat better and learn healthier lifestyle habits? Call 719-556-5787 for more details or to schedule an appointment. Exercise Prescription and assessments providing injury recovery, prevention, and enhanced performance to all populations. If you struggle to meet your AFPFT standards, this could help you reach, and exceed, your goals. Please call 719-524-CARE and ask for Peterson Health and Wellness Center to schedule an appointment. If you would like additional information or have questions, please call 719-556-4292.